YouTube videos default to auto-play on load, as well as automatically loading an playing a new different video in the playlist after the first video has completed. Some users may like YouTube video autoplaying, but some users may not. 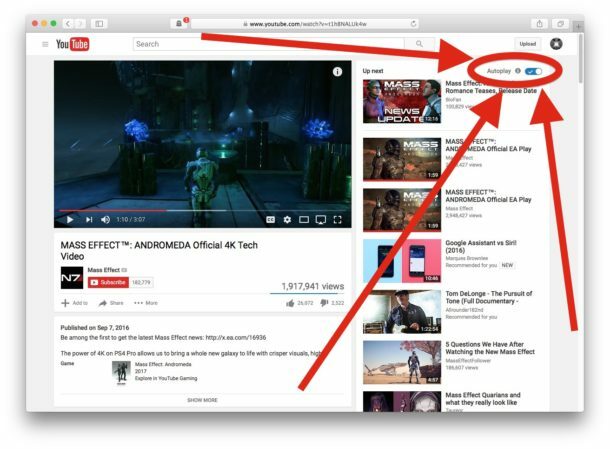 If you want to turn off auto play on YouTube, or turn video auto play back on with YouTube, this is how you can do that on any desktop operating system and any web browser. Another option is to click on the Gear icon of a playing YouTube video, and toggle “Autoplay” off from there. Once you turn off auto play video, it will impact not just the current YouTube video but all other YouTube videos you watch from the same logged in YouTube account or on the computer with the same browser and cookies. And yes that also applies to watching a video in Mac picture-in-picture mode. For what it’s worth, you can turn off video auto play but still have an existing video loop that is already playing by using the right-click method detailed here on how to loop YouTube videos. From the mobile side of things, there is not a direct way to stop auto play from the web browser, but in iOS YouTube app you can toggle the same “Autoplay” switch to be off or on. It doesn’t work. Still autoplay…. doesn’t work… any other suggestions? John, it works. The switch toggles autoplay off and on, it is a YouTube feature. No, it doesn’t work. It stops the next video from autoplaying, but try having a couple YouTube tabs open in Safari, then switching to another window so they’re not in the foreground. Now quit Safari and restart it. One of those YouTube tabs will autoplay a video, or autoplay an ad. This even happens when on someone’s channel homepage. It doesn’t happen every time, but about every second time when restarting Safari. When I do that either replace anyway or the next time I go to the page it’s turned back on again. Very user hostile! Perhaps you are in an “incognito” or “private browsing” mode, or you have cookies disabled? Yep, this has worked fine for me as long as I can remember autoplay being a thing. Thank you so much! That’s another aggravation done away with :-). For me it stopped automatically loading and playing a new different video. The original video still autoplays, but at least it stops when done. I tried saving cookies created as I turn off autoplay. Has absolutely NO EFFECT upon saving setting in YouTube. YouTube will not save the setting in Sierra 10.12.1, nor saving the cookies created as any effect. YouTube is a sad harassment one must endure to view videos. Each browser has a setting to prevent that, or offers extensions that do, such as Flash Control for Firefox. In Firefox, you can also choose to set “media.autoplay.enabled” to false via about:config. I believe this setting only affects the playlist, not the video on the current screen. If I’ve made my way to YouTube, it can reasonably expected that I want to watch videos. What’s infuriating are sites that embed YouTube-hosted videos on their pages, and *they* begin to autoplay after a link is clicked. A different context and not a desirable result, especially when a number of tabs are loaded in the background. That requires Firefox’s media setting, or an extension to thwart. For me, it also has the side effect of having to quickly pause and resume a video when I actually do want to watch a video, which is irritating in itself. Some sites respect their users when it comes to things like this, or obtrusive advertising. Most still don’t a clue, or don’t care, so countermeasures are still required to browse the modern web. What I’d love to see is a global in Safari to disable autoplay and autoload (prefetch) of HTML5 videos, just like on iOS.